Concept Description: A Hole in the Ground! Han and Chewie’s Big Adventure! Lets take a break from talking about abstract rebel spaceships for a bit. In the last twenty four hours we’ve seen a Stormtrooper at a site of ruins in a forest. We have heard Han and Chewbacca have an adventure together and the source of the pics believes Han dresses as a Stormtrooper in the film. All this points towards Han and Chewbacca going on some kind of mission together, just like in the old days. Well, there’s concept art to back up this claim for the most part. A very green mixed deciduous forest paints the background. This location is in the thick of it, that’s for sure. There is a large hole in the ground. The hole is in the shape of a hexagon. The hole is for a metallic structure of some kind, very Imperial looking, indicating an underground Imperial base. Each line of the hexagon has a pillar sticking out of it about the size of a man. These could be to give troops exiting the underground facility some cover to fight off attackers, if the pillars serve any function at all. Each line of the hexagon inside has two lights, which illuminate the underground structure we can barely see into. There appears to be a ramp inside leading to the surface. Outside of the structure is a data terminal of some kind. It reminds me of Star Wars Galaxies in a way. But who cares about that? Emerging from the “Imperial hole in the ground” are none other than Han Solo and the mighty Chewbacca! Han Solo wears his classic black vest and pants. His gun is raised in the air, ready to shoot first if need be! Chewbacca stands to his left, he appears to hold a big riffle type blaster, no robotic hand, and his classic bandolier over his shoulder. We can see the two heroes from an angle behind the pillars they are using for cover as they look towards the camera for any foes to attack. So it appears Han and Chewie have a scene or sequence together in the film where it is just them. In the concept art, they appear ready for a straight fight, but they’re still sneaking around. Might this sequence in its final iteration feature Han Solo in a Stormtrooper outfit? Hard to say. 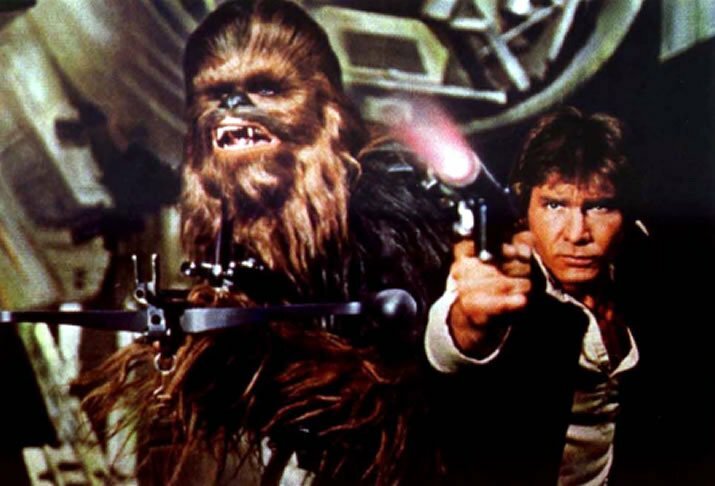 But one thing is for sure, Han and Chewie are back in action in Star Wars: Episode VII! Together again. Same as always. I can’t wait for this film. There could be someone standing beside Han Solo but behind the pillar to his left, our right. There also might be bones near the bottom of the frame. It is either some sort of interesting new plant life or bones. If there are bones there, it really changes the context and could be a hint those giant creatures from the storyboard sequence we talked about are out there. But both of these details are too hard to read for certain.